You cannot see the wind but you can see its effect. True? There is cause and effect in everything we do. Every action comes with a consequence. Quality issues, health and safety concerns, high absenteeism and turnover, missed deadlines, increased number of mistakes, workplace conflicts, disengaged and demotivated employees and unreasonable long work hours should leave a clue. Something isn’t right but how to make it right? Nobody knows. Some also choose to look the other way. We are in the “Age of Technology & Knowledge Workforce”. The “Industrial Age” is long gone but the management style from that age is still well and alive. 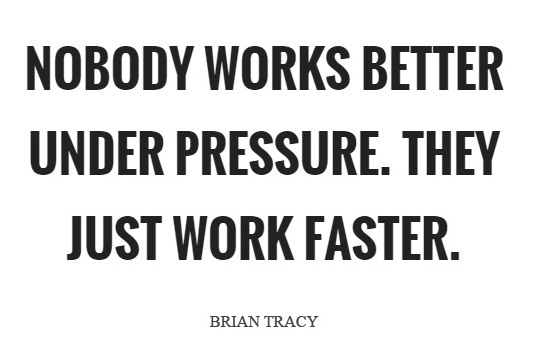 It drives me absolutely crazy when I see in job descriptions that a person has to “work well under pressure”. Listen to me. If you go to a job interview and someone asks you, “How well do you work under pressure?”, make sure to find your way out of this company as fast as you can. Being a runner, I would actually run. Don’t get me wrong, we all have to handle pressure every once in a while and some people are definitely better in handling pressure than others, but who wants to have this as a job expectation? If dysfunctional behaviour and disorganization takes over, this work environment will consume your life and in next to no time you won’t even remember anymore that you actually have the right for a life outside of work. don’t think before they make a decision. think they have no choice. How can a person who works under constant pressure be innovative and creative? constant pressure doesn’t result in a productive and mentally healthy work environment. Fortunately it is never too late to make adjustments to cultivate workplace civility. Let’s work together and challenge the status quo.